The Top 25 European SharePoint Influencers for 2016 mark the 6th iteration of an esteemed list of thoughts leaders who showcase the power and value that individuals bring to the Microsoft ecosystem. Patterns and Practices (PnP) December 2016 release is out! SharePoint/Office 365 Dev Patterns and Practices December 2016 release is out with new contributions from community for the community. Read this post to overview all the details related to what was included with the release and what else has been happening in the PnP during the past month. Office 365 Connectors are a great way to get useful information and content into your Office 365 Groups or Microsoft Teams, which is then available for the end users. Visio is coming to the web and iOS. The product group released the December 2016 Cumulative Update for SharePoint Server 2016 product family. This CU also includes Feature Pack 1 which was released with November 2016 CU. 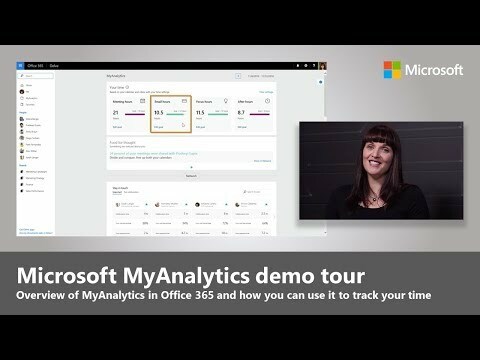 Product lead, Catherine Pidgeon, demonstrates MyAnalytics in Office 365 and how you can use it to assess your time at work, including who you’re spending your time with, how you are using your time in meetings, your overall email habits and the impact of your communications with others. This PnP Webcast by Waldek Mastykarz and Vesa Juvonen covers considerations around multi-view web parts, where the presentation layer is changed based on the status of the web part, and includes a demo with a sample web part built with React in practice. Learn how to generate a three-screen app automatically to manage data in a SharePoint list with PowerApps. In order to better understand the SharePoint landscape, Sharegate company collected key information on SharePoint and Office 365 usage and deployment worldwide. Read article to take a closer look at modern web parts. The new SharePoint Framework has a safety net when you develop and style your components. Whenever you write a new style sheet class this will be picked up by a SASS preprocessor that first compiles the SASS file and then applies a special random string to the class name. Read article for more information. In episode 110 of the Office 365 Developer Podcast, Richard diZerega and Andrew Coates talk with Yina Arenas about updates to the Microsoft Graph. This series of 10 videos provides training for implementing Azure ExpressRoute for Office 365. It features Jon Ormond, Paul Andrew, Konstantin Ryvkin, Joshua Maher, Hao Yan, Paul Collinge, and Duong Au. New SharePoint Client Side Object Model (CSOM) version is targeted for the Office 365 or more specifically for SharePoint and Project Online. There are some updates on what has changed with SharePoint Server 2016 BI. Updates include architecture changes to the SharePoint-based on-premises Microsoft BI Stack and how you can benefit from upgrading your BI farms to SharePoint Server 2016, SQL 2016 and Office Online Server with Excel Online. Microsoft team is announcing several updates to the Office apps to help you easily and effectively collaborate with others.This includes real – time co – authoring in PowerPoint, the ability to upload attachments to the cloud directly from Outlook and other collaboration capabilities. As part of the SharePoint/Office 365 Dev Patterns and Practices ownership changes to SharePoint engineering, PnP team has decided transfer the PnP initiative GitHub repositories from OfficeDev GitHub organization to SharePoint organization. Drop 6 of the SharePoint Framework is now available also with first release tenants. This PnP Web Cast with Paolo Pialorsi and Vesa Juvonen is around the Office 365 Connectors. This is PnP Core, PnP PowerShell and provisioning engine Special Interest Group (SIG) weekly call recording for the 30th of November meeting. In this PnP Webcast, Vesa Juvonen concentrated on covering the considerations around multi-view web parts, where the presentation layer is changed based on the status of the web part. In this PnP Webcast, you will look at the client-side web part to build a real time notification model with SharePoint Framework using React.js, Office UI Fabric React components, Azure Logic Apps, Azure Storage Queue, and node.js. Office 365 Accessibility Product Manager, Malavika Rewari, walks through specific tips and updates that help you to author accessible content with Office 365 and ensure your peers with disabilities can consume your content without any issues. Look at this short web cast by Microsoft Mechanics about Intelligent new capabilities in Excel, Word, PowerPoint and Outlook, including updates to personal work analytics. For SharePoint Online and SharePoint Server 2013, you can easily add a Yammer feed to a SharePoint with Yammer Embed. This blog post will show how to do it. Should you start writing production code on the SharePoint Framework now? Modern pages are starting to become prevalent (and the default), and users are using them – so if you’re customizing SharePoint or adding new functionality based on web parts, you might run into problems soon if your web part will not work here. Read article for more details. Smart filters can help you find the file or list item you’re looking for. When you make a filter selection, items that don’t match are removed from the list shown on the page. The DIWUG SharePoint eMagazine is a free downloadable magazine with articles written by MCMs, MVPs and other authors from the SharePoint community. The target audiences are IT-pros, developers and end (power) users. This blog post by Waldek Mastykarz where he shares his slides from the recent Unity Connect 2016. Take a look if you are interested in presentation about building productivity solutions using the Microsoft Graph. This blog post by Chris O’Brian is about new modern pages (they are also in SharePoint team sites in Office 365 now) and how they are working. 10 ways to move a SharePoint document. In this article, you will learn how to perform basic list item operations in SharePoint using TypeScript with the help of classes and variables.